Should you tune in to Telstra TV? Since exploding onto the scene around the start of 2015, streaming video on demand services have taken Australians by storm. Streaming video on demand refers to subscription TV services such as Netflix and Stan – and if you’re looking for a no-fuss way to watch the above on your television, Telstra TV may be your answer. Telstra TV is a bundled TV content service provided by Australia’s largest telco, and available exclusively to Telstra broadband customers. If you’re already a streaming video viewer – or you’re getting ready to dip your toe into the brave new world of Netflix, Stan and more – Telstra TV is the easy way to bring all your home entertainment together on one device. Connect to Telstra TV, and you can easily search across live and on-demand film and TV content, and switch between free-to-air and streaming services from a single screen. It’s a user-friendly alternative to smart TVs, offering a simple-to-navigate home screen with easy access to on-demand video apps and live television. 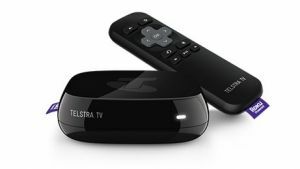 The Telstra TV device is basically a re-branded version of the ‘Roku’ – a popular streaming and media player in the U.S. It’s provided on selected Telstra broadband bundles from just $99 per month (including your broadband plan), or for $216 as a stand-alone product. Telstra TV gives users customers access to both paid subscriptions (Netflix, Foxtel Now, Stan, etc.) and free TV, like the ones mentioned above. It’s basically a simple way to start exploring streaming TV and on-demand entertainment, although you will need to purchase subscriptions to paid services such as Netflix separately (the exception being sports service Kayo, which can be bundled in with your Telstra broadband plan). To connect Telstra TV, you’ll need a compatible television with an HDMI port, and antenna to access free-to-air channels. You’ll also need a broadband connection of at least 3.5Mbps, but Telstra’s NBN options should provide more than enough speed for buffer-free streaming. It’s a one-stop shop for all your TV and streaming needs, and allows you to search simultaneously for titles across free-to-air and streaming services . No wires or computers; it integrates perfectly with your TV, just like a standard set top box, and you can use your own mobile phone as a remote control. It’s available bundled-in with eligible Telstra broadband plans from $79 per month ($99 for unlimited data). It’s run on an existing, successful platform (Roku), and offers automatic app updates (unlike smart TVs). It now works with Google Assistant, so you can use smart devices such as the Google Home to control your Telstra TV via voice. Which broadband plan do I need for Telstra TV? Telstra TV is currently only available to Telstra customers. You can choose to bundle the device with a two-year broadband plan, or buy it as a standalone purchase. If you would like to buy Telstra TV by itself, you’ll pay $216 outright, but will enjoy all the features you’ll find on a bundled broadband-and-streaming plan, including integrated live, catch-up and streaming TV. Telstra TV is currently an add-on extra on Telstra’s Essential and Unlimited NBN plans, with prices beginning at $9 per month. You can also pick it up on an internet + Telstra TV package, with prices starting at $79 per month for 200GB of data, or $99 per month for unlimited data. For this price, you’ll get unlimited data on the Standard Plus Evening Speed / NBN 50 tier as standard. This provides a maximum download speed of up to 50Mbps, though Telstra says typical peak speeds are more like 40Mbps. A Premium Evening Speed (NBN 100) boost can be added for an extra $30 each month (or $129 in total). Unlimited standard national calls are also included on all plans. Telstra’s $70 and $90 broadband plans are listed below. If you’re not yet in an NBN-ready area, you can connect to Telstra TV via the telco’s ADSL2+ and cable plans. Telstra’s cable and ADSL prices once again start at $90 per month for unlimited data on a two-year plan, or from $70 for 100GB of data (currently 200GB when you add Telstra TV). As with NBN plans, a $99 set-up fee applies for new customers, but this may be waived if you buy online. If you’re looking for an ADSL/cable and streaming bundle, plans are now offered on a month-to-month, casual basis instead of the lock-in two year contract, although modem charges may apply. Telstra is also offering customers who add Telstra TV to their eligible broadband plan a $125 Telstra TV Box Office credit – enough for 20 free new release rentals. This offer is available through to 30 June, 2019, and customers must activate and register Telstra TV Box Office before 26 August, 2019 to qualify. How does Telstra TV compare? The combination of Telstra TV, and a home broadband plan bundle, is definitely one of the more convenient ways to access paid streaming TV and movies. However, depending on your data requirements and content consumption habits, you may prefer other similar options. Apple TV, Fetch TV, and the Foxtel Now Box exist as the primary competitors to Telstra TV, as they each combine a device with a remote (and streaming capability) right out-of-the-box. For maximum convenience, you can’t go past Telstra TV. As far as work on your own behalf, Telstra TV keeps everything simple: you can bundle it with your monthly broadband, as well as add home phone, a 24-month Foxtel Now package, and even Kayo sports streaming – all on a single bill. 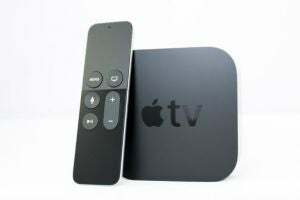 In comparison, Apple TV seems to be the best device for accessing apps and the world of Apple and iTunes. Not only do you have access to the likes of Netflix, Stan, and Amazon Prime Video, you also have access to the huge iTunes library of music and movies, as well as Apple’s comprehensive App Store – so you’re no longer limited to your smartphone for gaming. This is all available to browse and buy via the remote, or through the Siri voice-activated assistant, which is integrated into Apple TV. The Foxtel Now Box offers a similar plug-in-and-play functionality, and is priced at $99 outright (although you may be able to grab it at a discount if you buy at the right time). This device allows easy streaming of Foxtel Now (Foxtel’s own video-on-demand service), as well as free-to-air channels, and selected apps including Stan and YouTube. The major downside is that the Netflix app is not yet available on the Foxtel Now Box, which is likely to turn off many potential buyers. Finally, Fetch TV features a similar setup, but has its own subscription packs available, offering channels like ESPN, MTV and so on. Prices begin at $169 for the Fetch Mini, but to be able to record live TV you’ll need to shell out $449 upfront for the Mighty box. You’re also able to bundle your Fetch with an eligible plan from Optus, Dodo, iiNet, Internode, iPrimus, Aussie Broadband, or Westnet, as listed in the below table. Is Telstra TV worth the money? Telstra TV comes as part of a larger home entertainment bundle, which is available from $79 per month on eligible Telstra plans. If you’re in the market for a new broadband plan anyway (and aren’t willing to settle for less than unlimited data), then Telstra’s bundle might be a no-brainer. Convenience will likely be a key selling point for the Telstra TV; the consolidation of most streaming outlets into the one unit, and the ability to package TV with broadband, is bound to attract plenty of buyers happy to combine it all on a single account. However, if you can’t justify the extra cost for convenience, there are several other means of obtaining the best on-demand streaming and home entertainment – be it opting for a smart television, or using devices such as Apple TV, Fetch TV, and Foxtel Now. All of these options are well worth looking into, but at the end of the day, Telstra TV offers convenience and ease of use that’s hard to beat.